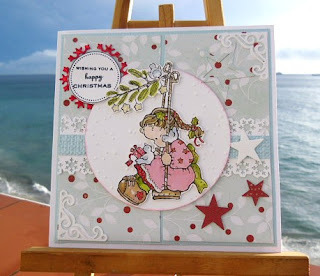 Lovely Christmas card Sylvie and such a sweet image...the sun is out over here in Somerset but I dont know how long for! Have a good day. Beautiful card Sylvie, I like the image and the gorgeous papers. Beautiful card - love the embossing behind the image! Aww Sylvie this is such a pretty card. I love the little pop of red .